As some users know, WPS Office supports many different languages including English, French, German, Polish, Portuguese, Russian, and Spanish. For the latest version of WPS Office (Version 10.2.0.5820), the available languages depends on the language version of WPS Office. WPS Office also contains a spell checker. Step 1. If you want choose a language version other than English, please go to the Download Page and choose the language version you want. Step 2. 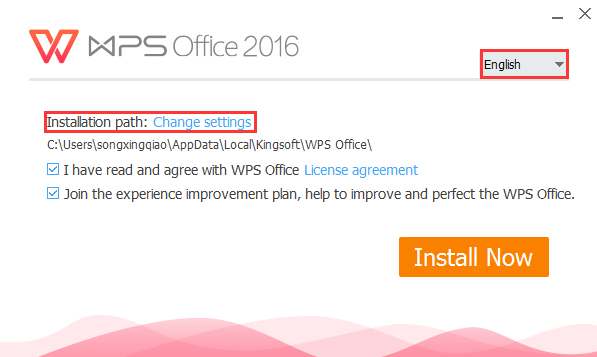 After finish downloading WPS Office, please choose a path you want to install in the pop-up dialog box. Here choose the English version as an example. Step 3. After you install WPS Office, it will automatically open for the first time. If you want to know about how to check the spelling of the language, please visit this page.